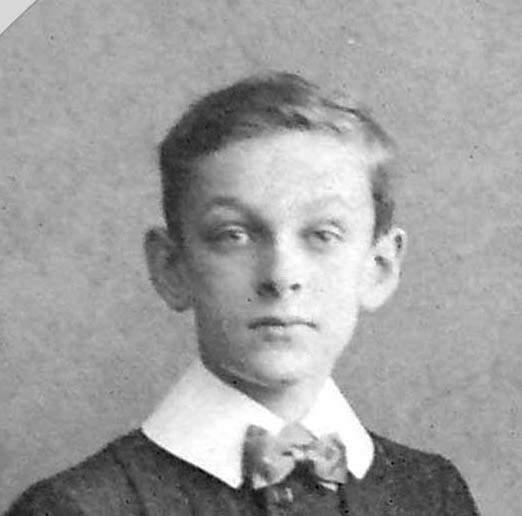 At first glance, the life of Prince Victor Victorovitch Kotschoubey / князь Виктор Викторович Кочубей (1893-1953) could be construed as fairly unremarkable within the confines of a universe of White Russian émigrés who all seem to share a story of lost fortunes and adventures leaving Russia to begin a new life in the west. Almost like his father before him, it was a life extinguished at the age of 60, and some might say that it ended while he was still fairly young. With the exception of his former brother-in-law and fellow Guard’s officer who also dies at 59, he predeceased the other protagonists in our story by more than twenty years. Perhaps, this lack of remark-ability came down to the fact that Victor did not possess the material and social benefits that come from marrying into wealthy American families. That added wealth in a post-Revolutionary world would have certainly helped to push forward yet another generation with the incredible privileges that his aristocratic birthright would have insured for him had Russia not fallen into revolution in 1917. Alas, in putting together an understanding of this life, one is confronted with few old photographs from the society pages popping up on Google searches and certainly no family left to carry his story into the present. In the late summer of 2016, Alexander Kotchoubey (1971- ) received an intriguing email from a local Ukrainian historian, Alexander Bratskiy living in Dikanka in the Poltava region of Ukraine. The obvious connection is that the village of Dikanka had been in the Kotchoubey family for over 300 years and while today little remains of the family except four 400 year old mighty oaks, a 19th century church with the family crypt built in the Russian classical style and a pretty arch constructed ahead of an anticipated visit by a Russian emperor which never took place. The village is also famed as the birthplace of one of Russia’s greatest authors, Nikolai Gogol and is the subject of a book that most school children in the Russian speaking world will read. On a recent visit to Poltava, Alexander Kotchoubey was hailed as the scion of a great family and greeted by people happy to say that they lived or worked or ran the lands that had once belonged to the Kotchoubey family. These touching but arguably scattered memories of the once famous family that inhabited the region suddenly divulged a mystery that if true would make the unremarkable life of Prince Victor Victorovitch the subject of an incredible journey back home against the odds of revolution, war and circumstances. In 2016, Alexander Bratskiy wrote in a cryptic email asking me to confirm the rumors that had circulated in and around Dikanka since WWII that Victor Kotchoubey had returned to Dikanka, and visited anyone left from the old estate including his wet-nurse/nanny. The year was 1944 and he may have been a pilot or an enlisted advisor. There was some word from Bratskiy that he was a Captain in the US Army Air Force (USAAF). Similar rumors had been circulated in the past and were never verified by Andrei Sergeivich (1938-) but as we shall see later there are some tantalizing clues that may help confirm these assertions. In September, 2018 I met with SP, the great grandson of Maria Bezkova / Мария Безкова, (her mother was born Likhopoi /Лихопой, a noble family from Tchernigov Province) who told me that her sister, Anna had met Prince Victor in 1944 in Dikanka. 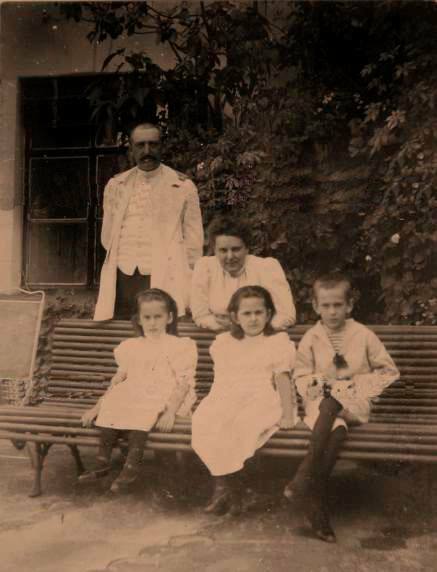 Having grown up with his sisters (a photograph below attests to their friendship as Maria is photographed with the two young Princesses, Sophia and Nadezhda) and having remembered him as a young man they both recognized each other. Unless Bratskiy was referring to the same person then we now have two eyewitness reports (passed by oral history) of Prince Victor in Dikanka. Up until this point, there is little public information or existing biographical data that would hint that Victor had anything to do with the US Army let alone Operation Frantic (known oublically during the war as Operation Titantic). There is a draft card dated 1942, the tantalizing clues passed down from people in Poltava and a move from Chicago to New York in the 1940s which is interrupted by some lost years. None of the obituaries including an obituary in the famous Russian émigré newspaper of New York City, the New Russian Word (or Новое русское слово) mentioned anything about him serving in the US army or visiting the front during WWII. 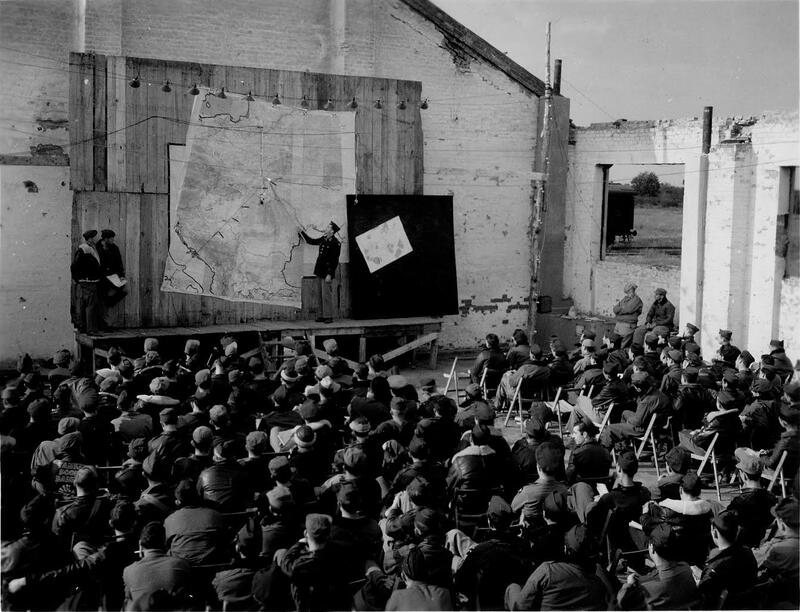 Even if Victor had helped with the logisitcs of setting up the Poltava airbase which was about 30 km south of Dikanka or served as a member of an air crew, the reality was that Operation Frantic and the presence of the US Airforce in the Soviet Union, was ultimately unimportant to the outcome of WWII in Europe. It was viewed skeptically by Churchill as well as Stalin and seemed to be doomed like the alliance between the Soviet Union and the West. If anything, it probably deepened the mistrust between the soon to be enemies of the Cold War because it demonstrated to the Soviets, the technological superiority of the US armed forces at the time. Victor would have also been greeted with the unbearable first hand knowledge that his family estate lay in ruins and that almost 350 years of family history lay in the ruins of Bolshevik hatred and a World War II battlefield. Given his support of the Russian people as a member of the Chicago Committee of Russian War Relief, Inc., this would have been an unbearable betrayal. 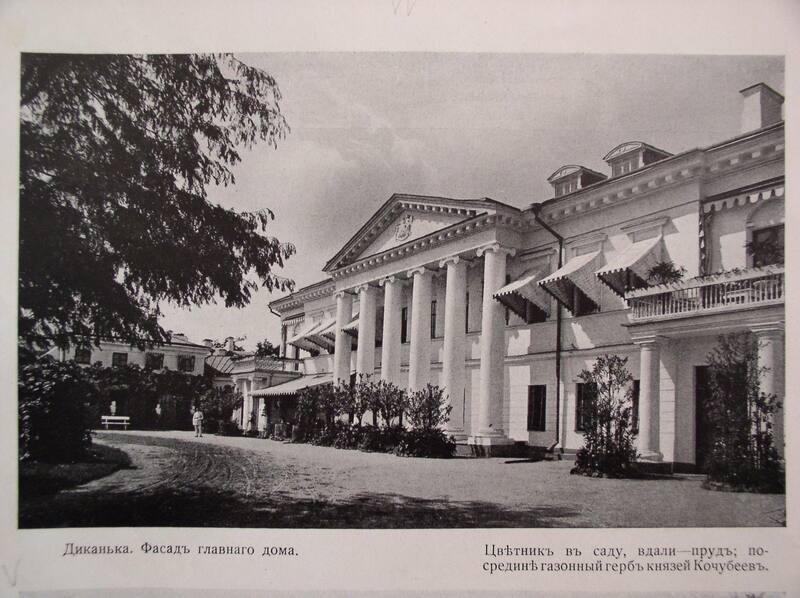 A photograph from the magazine spread in the September 1916 edition of “столица и усадьба” / Capital and Estate which featured an article on the Kotschoubeys and Dikanka, A photograph of the facade of the palace. Nothing about the Princes Kotschoubey seemed conventional in retrospect. While Victor’s father, Prince Victor Sergeievitch was an aide de camp and close friend of Emperor Nicholas II and his mother, Princess Elena Konstantinovna was a lady-in-waiting to Empress Alexandra Feodorovna, the family was careful to put distance between themselves and the often poisonous atmosphere of court life under Nicholas II. Infant, Elena Konstantinovna hated society life and preferred to spend as much time as possible on her estate in Dikanka while Prince Victor Sergeivich eventually turned down a number of very important appointments to insulate himself from the growing financial crisis within the Imperial family. So it is perhaps in this Tolstoyian paradox, that the Kotschoubeys were at once fixtures of the establishment within the Court and at the same time happy to remove themselves from this crazy world to retreat to their beloved estate. Photographs of life in Dikanka show a family full of humour and relaxed as they entertain their friends and visitors. It was anything but carefree as the Estate was an important centre of economic activity not only as an agricultural powerhouse but as a beer producing, sugar making and livestock breeding centre. After the February Revolution of 1917, it was no wonder that the Kotschoubey retreated to their estate in Poltava and that they would ultimately flee to Europe from Kiev in 1918. Victor’s cousin and contemporary Vassili Petrovitch Kotchoubey / Василий Петрович Кочубей (1868-1940) who was also at Court and appointed Master of Ceremonies of the Court / Церемониймейстер Двора in 1914 would have a similar attachment to his estate in Poltava called Zgurovka / Згуровка where he too fled in 1918 and from where the family eventually made their way to Geneva, Switzerland and then ultimately, Germany. An unconventional Start to an uncertain future. There are indications already in Victor’s early years in St. Petersburg that suggest that his parents’ wariness of the Court or Victor’s own stubbornness was somehow the explanation for Victor’s unusual decision as the scion of an important family to study Economics at the Polytechnic Institute of St. Petersburg from where he graduated in 1916. Perhaps, had he been able to do something with this degree in his later life, one could explain this decision as part of a self motivated ambition to pursue a life outside convention. Sadly it proved to be the beginning of an almost rootless existence that was driven as much by the support and guidance of different members of an extended family as it was an indication that Victor did not really know his place. Following the completion of his University studies at the age of twenty three, Petrograd, as it was now called was in full war mobilization mode and young men were doing their duty in the face of the 2nd Great Patriotic War (the first being the War of 1812). Yet something here was unusual too. Within the context of the age, most 20 year old male aristocrats were desperate to fight in the war and show their bravery and patriotism. Victor was enrolled into an accelerated officer training school at the Corps des Pages and was commissioned an ensign/прапорщик in none other than his father’s regiment Her Imperial Highness Empress Maria Feodorvna’s Horse Guards Regiment, 1st Horse Guard Division / Кавалергардский Ее Величества Государыни Императрицы Марии Федоровны полк 1-й гвардейской кавалерийской дивизии. 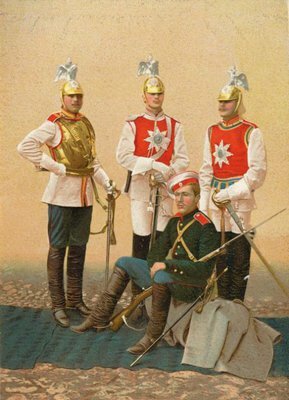 The Horse Guards regiment was as much a family affair as serving the Imperial household and various members of the small but influential Kotchoubey family served as officers of the Guards Regiment. The brief and somewhat uncharacteristically short service in the regiment was certainly assured for Victor by the family’s connections and that small not too unimportant fact that Victor’s father was a lieutenant general in the regiment as of 1911. After the accelerated officer’s training, he would join his regiment for an all to brief moment. Over the course of his life, Victor would return to these Russian roots in his association with his fellow graduates of the Corp des Page and his fellow officers of the Horse Guard. His cousin Vassili Vassilievitch Kotchoubey / Василий Васильевич Кочубей (1893-1971) was a cornet in the 3rd Squadron /3-й зскадрон in 1914. In the last years before the fall of the Russian empire, Vassili Vassilievitch would go onto to become an adjutant to Hetman Pavlo Skoropadsky / Павел Петрович Скоропадский (1873-1945) who in 1909 was a colonel and field adjutant of the regiment. The “White Russian” movement meant that at a certain point in the period around 1917, Russians had to pick their sides. The brief rule of the Provisional government made that choice less clear as there were plenty of “Whites” who accepted a republican vision of Russia. It was only at the start of the Russian Civil War after the October Revolution that you were either White or Red. Victor’s father, Prince Victor Sergeivich was briefly imprisoned in the Peter and Paul Fortress in February 1917 and then released shortly after that by order of the Minister of Justice of the All Russian Provisional Government / Министр юстиции Всероссийского Временного Правительства, Alexander Feodorovitch Kerensky / Александр Фёдорович Керенский, (1881-1970). By the middle of April, Prince Victor Sergeivich was relieved of all his posts and it is at that point that he leaves for Kiev. Interesting to note that a few months later, his cousin Vassili Petrovitch after the October revolution was asked by a fellow Ukrainian & brother mason, Anatoly Vassilievitch Lunacharsky / Анатолий Васильевич Луначарский (1875-1933) under a request of the People’s Committee (нарком) to work for the Foreign Ministry or People’s Commissariat of International Affairs / Наро́дный комиссариа́т иностра́нных дел under Leon Davidovich Trotsky (Bronstein) /Лев Давидович Троцкий или Лейба Давидович Бронштейн (1879-1940). Vassili Petrovitch spoke seven languages including 5 eastern languages and that alone would have been quite useful to the new Soviet government. After which he was given 24 hours to leave the country. It is in the context of these high level government decisions that began to eliminate the family from Russia’s ruling class, that Victor Victorovitch is “ordered” to Paris as part of a military mission where he no doubt reports to Count Alexei Alexeivitch Ignatieff / Граф Алексей Алексеевич Игнатьев (1877-1954) who in 1917 is still the Russian Military attache at the Russian Embassy in Paris but will soon switch to the Soviet side and be known as the Red Count and a traitor to many Russians. In addition, Victor no doubt meets another military attache General Dimitri Ivanovitch Osnobichine / Дмитрий Иванович Ознобишин (1869 – 1956) who is aide de camp to Alexander Georgievich, 7th Duke of Leuchtenberg, or Prince Alexander Georgievich Romanovsky, (1881-1942) who was a cousin by marriage to Prince Leon Mikhailovitch Kotchoubey/ князь Лев Михайлович Кочубей (1862-1927). It is unclear if this family connection played a role in Victor’s presence in Paris but it quickly becomes clear that Victor will play no outward role in the fight against the Red Army and in the Civil War as he travels to the US shortly after the October Revolution, in the early part of 1918. Herein lies the first clue, that Victor will not play into conventional roles by following in the call to arms of many of the guard’s officers and most of his Kotchoubey cousins to serve in the Volunteer Army. More importantly, his first departure for the US stands as a testament that the choices that lay ahead were to wait out the unfolding events and return or acknowledge that the world that Victor had known was gone. Perhaps his parents wired him a message to leave until matters were back in control since his father was plotting in Kiev with other officers to mount a rescue mission for the now deposed Emperor in Ekaterinburg. Alternatively, he may have realised that with all members of the Kotchoubey, Orloff & Belossersky-Belozersky family out of Petrograd, the game was lost. It remains unclear why Victor did not fight against the Bolsheviks and it may have been upon the advice of General Dimitri Ivanovitch Osnobichine, who was a very close friend of Prince Alexei Nikolaievitch Orloff / Князь Алексей Николаевич Орлов (1867 — 1916). Prince Alexei Nikolaivich was also a military attaché at the Russian Embassy in Paris but he died in 1916. His brother was none other than Victor’s uncle Prince Vladmir Nikolaievitch Orloff / князь Владимир Николаевич Орлов (1869-1927) married to Princess Elena Konstantinovna’s sister, Olga Konstantinovna Orlova (née Princess Beloselsky-Belozersky) / княгиня Ольга Константиновна Орлова (урожденная княжна Белосельских-Белозерских) (1874-1923). Orloff known as “Fat” vs. General Orloff who was known as “Thin,” was scandalously forced to retire from Nicholas II’s retinue in the early part of the 20th century and he placed himself in self-imposed exile from the court, he arrived together with Victor’s Aunt Olga to France from the Crimea in early 1918. Perhaps few other person would play a more important role in Victor’s future than his soon-to-be brother-in-law Georgi Stepanovitch Woyevodsky / Георгий Степанович Воеводский (8.03.1891- 4.07.1950) who was a cornet in the 4th Squadron / 4-й эскадрон in 1914 and then appointed to Rotmeister/ штабс-ротмистр in 1916 . He was also awarded the St. George’s sword for bravery after charging a German position. He would marry Victor’s younger sister, Princess Sophia Victorovna / Софья Викторовна (1896-1920) in 1918 but their marriage would end shortly afterward their wedding when she dies in Constantinople in 1920 of typhus. Quickly following the revolution and at the start of the Russian Civil War in 1917, Victor was named as part of a military delegation to Paris. However in 1918 he left for the United States. No doubt through his maternal uncle, Prince Sergei Konstantinovich Belosselsky-Belozersky / князь Сергей Константинович Белосельский-Белозерский) (1867–1951) who was married to the American, the former, Miss Susan Tucker Whittier (1874 – 1934), the daughter of an American Civil War Union Brigadier General, Charles Albert Whittier (1840-1908). It appears that he worked for half a year as a factory worker and then decided to return to France in 1919 where he worked from 1923-1925 as the secretary for the Russian Bureau of Employment. By that time his mother had settled in Paris and his father had passed away on December 4th in Weisbaden in 1923. In addition, he founded and headed a furniture workshop in Suraine, France, near Paris. Like many of the Russian émigrés he was a member of the Association of the graduates of the corps des Pages and a member and founder of the masonic lodges The Golden Fleece and the Northern Lights. Yet another cousin, Vassili Vassilievitch Kotchoubey / Василий Васильевич Кочубей (1883-1960) would be a 33 degree mason of the Russian masonic lodge Astrée which was moved to France following the Revolution. Maria was a fashion designer who worked under the alias Maria Novitskaya (Mary Nowitzky or even Jowitsky in some newspapers). Maria and Victor moved to America and certain newspaper reports suggested that they were still married in 1938. Victor used the alias Mr. Koch. It is not clear if they were ever officially were divorced but records show that by 1940 he was living with his new wife. As a matter of record, Maria moved back to Europe and died in Cannes on March 30th, 1965. 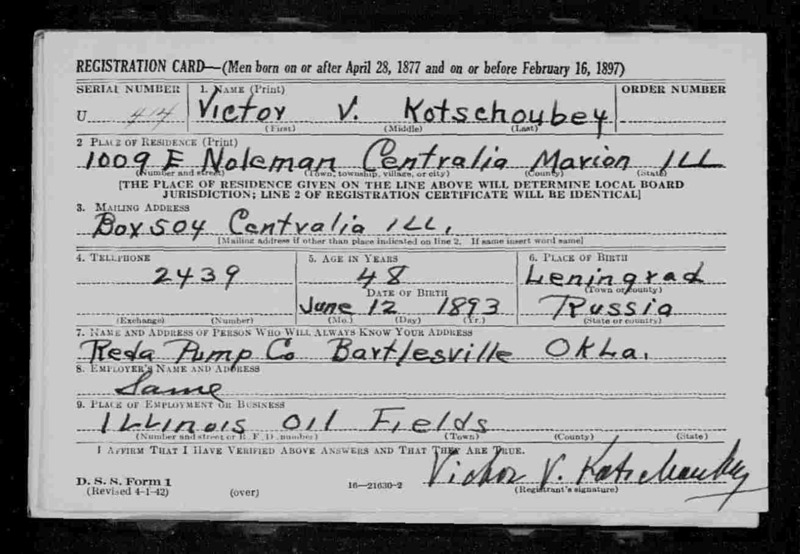 Victor lived near Chicago, Illinois at 1009 East Noleman Street, Centralia, Centralia Township, Marion, IL according to the 1940 US Census data. The house can only be described as a small working class home with a second floor beneath the roof and an otherwise unassuming wooden clapboard small colonial. Sometime in the late 1930s, he had already met and “married” his “second wife” Princess Kyra Nikolaievna Kapnist de Kotschoubey (née Elaguine) in Chihuahua Mexico. According to available records, they arrived in the United States via El Paso, Texas. He was actively involved in a number of Chicago charities including the Chicago Committee of Russian War Relief, Inc. which was chaired by Dr. Dallas B. Phemister and Mrs. Philip Wyatt Moore. He appears on the list of Sponsors for a August 22, 1942 Shostakovich concert along with a number of Russian émigré including his former brother-in-law, George Voevodsky (married to Victor’s sister Sophia who died in 1920), George Bobrinsky, Michael Cantacuzene, Nicholas Galitzine, Serge Kutuzov, Marina Volkonsky and Prince and Princess Rostislav Romanov. George Voevodsky who was known as Colonel was married in 1933 to Maroussa Russell from Wake Forest, Illinois. Among the influential people in Victor’s American life, George would be among the first to die of a heart attack in early July 1950. Victor along with his former brother-in-law may have been a part of the United Russian-American Committee, as well. Interestingly, the Russian War Relief states that…”In this hour of crises for the United Nations it is our patriotic duty to convey our moral and material support to the fighting men, women, and children of the Soviet Union…We must help them HOLD THAT FRONT. Like many Russian émigrés, Victor had more than enough connections and family ties to try and survive in the new world. It was most likely not by chance that he found himself living and working in Illinois, as his former brother-in-law would have certainly played a role in pulling Victor to the midwest. Before the unit had completed testing, a fire broke out in the Briansk Steel Factory in the growing industrial city of Dnipropetrovsk, Ukraine (formerly, Ekaterinoslav) where Arutunoff was manufacturing in the original ESP workshop his pump and motor. The fire department could not catch the blaze which spread throughout the night, so one of Arutunoff’s engineers hooked up the test unit in a surface horizontal position and it pumped a large volume of water and put the fire out. Indeed, it remains a surprise to many in the industry that the first functional use of an ESP was actually on surface in a horizontal configuration from the test bench used in designing the ESP. When Arutunoff awoke the next morning he was rather famous, for the pump was literally an overnight success. Arutunoff’s early invention enjoyed wide application in Russia and later in Germany, for oil well pumping and dewatering mines and ships. After developing in 1916 the electrical submergible motor and pump, Arutunoff emigrated to America in 1923. He eventually settled in Los Angeles seeking to sell his idea to American backers; everyone he approached turned him down, saying the unit was “impossible under the laws of electronics”. ….We found one in Yorktown Heights. N Y. set on a lawn under beautiful trees. It is owned by Victor and Kyra Kotschoubey, gracious Russians long ago driven by the Communists from their native country. The food is delightful and Mr. Kotschoubey gave us his private recipes for two of the dishes *e liked best at this Croton Heights Inn. “Eggplant caviar is a Russian peasant dish and is very popular because the ingredients are readily available on every Rus^ sian farm,” he explained. Due to its delightful flavour, it has become a favourite dish of epicures in the Unites States, too. Kyra was born 15.08.1904 and passed away in 1984. She “married” Victor in 1940 and both ran the Croton Heights Inn (later called the Peter Pratts Inn). She was the daughter of Nikolai Alexandrovitch Elaguine (?) and Miss N. Popova. If indeed Victor’s journey to Dikanka in 1944 was true, it may have been the initiative or the influence of his first cousin Prince Sergei Sergeivich Belosselsky-Belozersky / князь Сергей Сергеевич Белосельский-Белозерский (1895-1979), who was an officer in the US Army Air Corp, serving as an American officer in the British Ministry of War Transport based in New York with over two thousand personnel. He served there until the end of 1945, where he was responsible for the Tanker Department which oversaw the transport of fuel oil, molasses, whale oil and palm oil by tanker and for liaison with other concerned government departments. He would retire from the US Army as a Lieutenant Colonel after his service in the Korean War in 1950 after a tour of duty where he served in the Prisoner of War Interrogation Section. Sergei was among a number of illustrious White Russians serving in the US forces which included, Prince Sergei Platonovich Obolensky Neledinsky-Meletzky (1890-1978) / князь Сергей Платонович Оболенский Нелединский-Мелецкий. Sergei Obolensky was born in 1890 and although educated in England before the Revolution, he returned back to Russia and served in the Horse Guards. He was a contemporary of both Sergei Belosselsky-Belozersky and his first cousin Victor Kotchoubey. Three officers of the Imperial Horse Guards regiment destined to wear uniforms of a foreign country and all within the precursor of the air force. In conversations with my father, Andrei Sergeivich (1938-), he believes that it is very possible that Sergei’s own decision to become a paratrooper in the US army at the age of 53 and then work for the Office of Strategic Services (the early name of the CIA) may have been a factor in Victor’s decision to serve in the US Army Air Corp as an Advisor to Operation Frantic which was conceived in Tehran in 1943. It is very possible that the US Army was looking for people who were familiar with Poltava where the major US airbase was to be established in a time frame of 4 months. What better person to help with reconnaissance and local knowledge then Victor Kotchoubey. 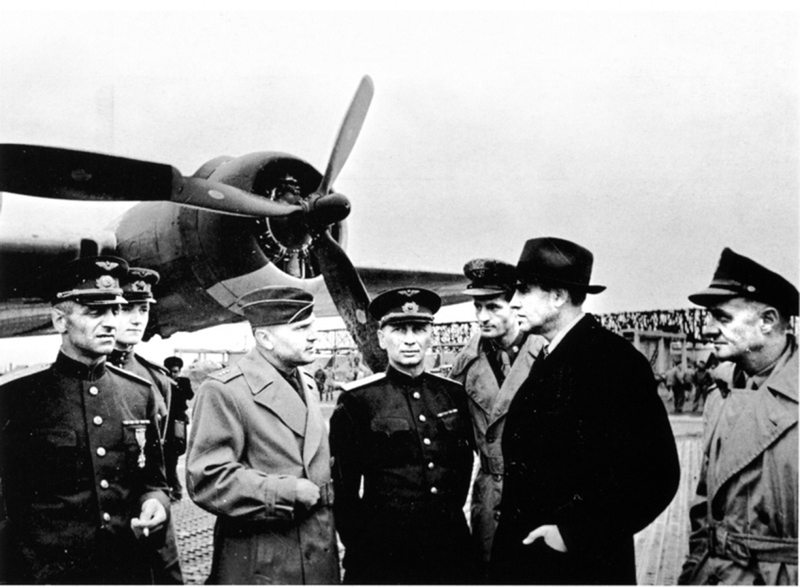 It is possible that when the first US advisors and military personnel arrived in Poltava in February 1944, Prince Victor Kotchoubey was among them. At this stage, if he was in fact in Poltava, it is unknown, how Victor would have traveled to Poltava in 1944. If he was allowed to join the bombing raids then he would have flown from England with the 8th wing or from Italy with the 15th wing. Alternatively, he may have traveled by US Army convoy from Egypt through the Holy Lands and then via modern day Iran and through the Caucuses to arrive to Poltava via the south, a journey that would have taken months and over 7,000 miles. It is not difficult to imagine the sights that greeted Victor when he arrived “home” in 1944. 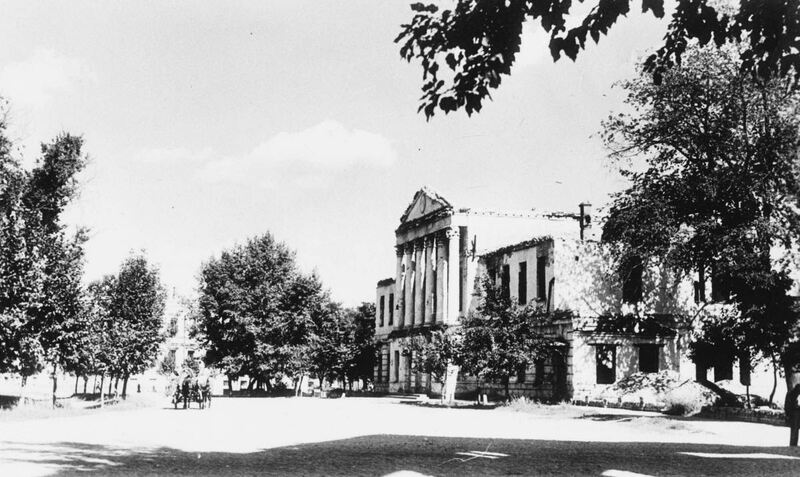 Poltava was devastated by the German offensive and subsequently the Red Army offensive in 1943 that retook the city. A youtube video (link) posting, shows a 1944 broadcast by the Army Pictoral Service Signal Corp in cooperation with the Army Air Force, entitled Operation Titanic. It is a somewhat feeble attempt to mask the name of the actual operation called Frantic and even more obvious that it takes place in Poltava once you see the monument to the Battle of Poltava of 1709. There is no footage of Dikanka in the US Army propaganda film but Poltava appears shattered by bombing and fire. Especially, symptomatic of the heavy cost of wars on lives and artefacts is the destruction of the Poltava Art museum which was created in 1919 following a donation from a member of the Wanderers artistic movement, Nikolai Yaroshenko. For Victor, who may or may not have known that the contents of his home, Dikanka, made up a large part of the museum collection as well as that of the Galagans from their estate Sokyrnytsi, the Kapnists and their estate Obukhivka, the Repnins/Volkonsky’s and their estate in Yagotin which after the civil war had been placed into public ownership. The museum which was located in the mansion which had belonged to the landlord Bolyubash was built in 1912 (the design was by the famous architect Aleshin) in a quiet nook of Poltava in number 11, Spasskaya street. The museum had a collection of 30,000 items. Items that were displayed were lost, while about 5,000 items had been evacuated and subsequently returned to the museum which was rebuilt by the end of 1944. Among the works that had hung in the museum were works by Giovanni Battista Tiepolo, Peter Paul Rubens, Melchior d’Hondecoeter, Adriaen van Ostade, Élisabeth Louise Vigée-Le Brun as well as Russian and Ukrainian masters. Sadly, the meetings between cousins was short lived. Andrei Sergeievitch remembers meeting his uncle Victor and his wife Kyra Nikolaievna only once at the the wedding of Count Alexei Mussin-Pushkin (Born: Pöbring, 09.07.1922, Died: Long Island, NY 26.08.1982 and son of Countess Ekaterina Vassilievna Mussin-Pushkin (née Kotschoubey) and Marina Voytsekovsky (they were later divorced). It proved to be the last time that the Sergei and his son Andrei would see their cousin/uncle Victor as he passed away shortly after their cousin’s wedding in Ipswitch, MA on November 20, 1953 at the home of Victor’s first cousin, Prince Sergei Sergeivich Belosselsky-Belozersky / князь Сергей Сергеевич Белосельский-Белозерский (1895-1978) and his wife the former Miss Florence Crane. It was perhaps a fitting place to die for a Russian Prince who was born in grandeur and ultimately died in the grandeur of the Crane family home, Castle Hill (see: https://en.wikipedia.org/wiki/Castle_Hill_(Ipswich,_Massachusetts). Only a few years before he had been to his ancestral home, Dikanka in the uniform of a US Army Air Corp soldier. Ironic perhaps that his final visit home was in the uniform of his newly adopted country where he lived half a world away. By that point Dikanka and the Kotchoubey world was in ruins and this lost world would never exist again. He is buried in the Russian Cemetery in Mahopac, NY not far from his Croton Heights Inn. More importantly, Prince Victor was laid to rest on land that was originally the estate of his cousin, Prince Sergei who together with his wife Florence (Russian name: Svetlana) donated the property to the Holy Synod (ROCOR) in 1949 upon hearing that both the Synod and the Miraculous Icon of Kursk would be transferring to the USA. Sergei and his wife viewed their estate in Mahopac as a residence for the church in exile (see excerpt below). 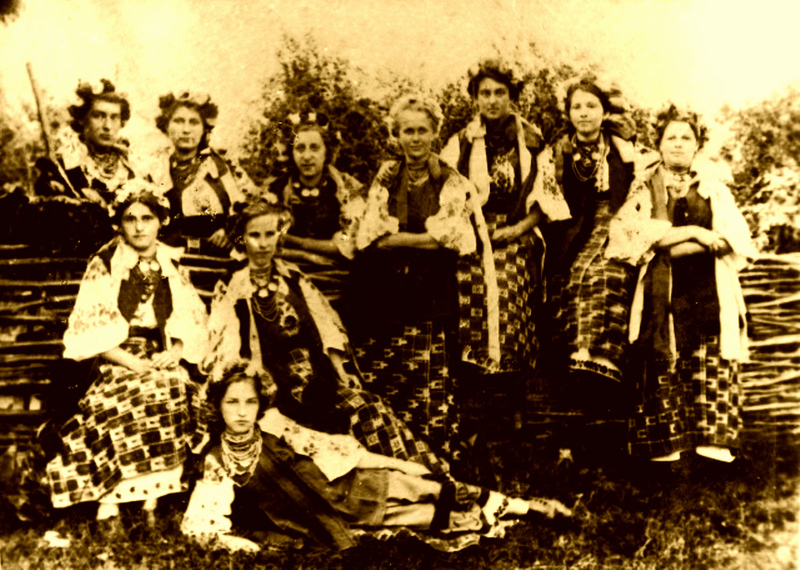 -1923 – Helped with Russian Emigrants to find employment in France. -1925 – Started a Furniture Factory in Suraine France. -1937 – Moved back to USA. Openned up a Russian Childrens Summer camp in NYS. Родители — главноуправляющий делами генерал-адъютант князь В.С. Кочубей и княжна Белосельская-Белозерская. Окончил в 1916 экономическое отделение Петербургского Политехнического института. Затем окончил ускоренный курс Пажеского корпуса и вышел в чине прапорщика в Кавалергардский Ее Величества Государыни Императрицы Марии Федоровны полк 1-й гвардейской кавалерийской дивизии. После революции прикомандирован к военной миссии в Париже. В 1918 уехал в США и полгода работал простым рабочим на заводе. В 1919 вернулся во Францию, был секретарем в Русском бюро по трудоустройству. В 1937 окончательно переселился в США. Открыл в Нью-Йорке пансион. Скончался в имении князя С. Белосельского-Белозерского возле Ипсвича, штат Коннектикут. По материалам «Памятки 25-летия существования синодального подворья «Новая Коренная Пустынь» в г. Магопаке, штат Нью-Йорк. 1950-1975», написанной Архиепископом Серафимом, издание Новой Коренной Пустыни, 1975 г.
Переселение значительного числа русских, оказавшихся после второй мировой войны в пределах Германии и Австрии, за океан достигло в 1949 году своей кульминации. Европа таким образом потеряла своё значение как средоточие русской эмиграции. Это вынудило Архиерейский Синод Русской Православной Церкви Заграницей (РПЦЗ) начать думать о перенесении русского зарубежного центра в Америку, куда отбыла основная часть русских изгнанников. Известные благотворители князь Сергей Сергеевич* и княгиня Флоренс (в крещении Светлана) Белосельские-Белозерские, узнав о предполагаемом переселении Синода и Курской чудотворной Иконы в США, любезно согласились предоставить в распоряжение Синода своё загородное имение около городка Магопак, в 40 милях от Нью- Йорка. В этом имении, с благословения Митрополита Анастасия**, решено было устроить ставропигиальное синодальное иноческое подворье, которое, по прибытии Синода в США, могло бы стать временной резиденцией Синода. Строителем и настоятелем этого подворья был назначен Синодом Епископ Серафим***. По его представлению новое подворье было названо «Новая Коренная Пустынь» в память разрушенной большевиками старой Коренной Пустыни в России, где была обретена Чудотворная икона в 1295 году. Формальная передача имения по купчей крепости князьями Белосельскими была закончена в конце декабря 1949 года. Владыка Серафим прибыл к месту своего нового назначения на четвёртый день праздника Рождества Христова, 10 января 1950 года по новому стилю. Прибыл по словам Владыки «в единственном числе и без копейки денег». Князь Белосельский, узнав от епископа Никона о затруднениях, согласился отпустить на ремонт большого дома 3.000 долларов. Нелегко на эти деньги было произвести столь большой ремонт. Дом был в весьма запущенном виде. Кухня почти вся сгорела. Отопление, канализация и электричество не действовали. Окна в нижнем этаже частично были выбиты, стены закопчены. Паркетного пола из-за грязи не было видно. Уже в воскресенье 29 января, через 19 дней после приезда Владыки Серафима в Магопак, было совершено освящение своей домовой церковки в отремонтированном заново доме. После освящения была отслужена в Новой Коренной Пустыни и первая литургия. Владыке пришлось служить «в единственном числе», с хором в два человека, при меньше чем десяти богомольцах-гостях из Нью-Йорка. * Князь Сергей Сергеевич Белосельский-Белозерский (1895-1978): паж Его Императорского Величества (1914), штабс-ротмистр (1917), участник Первой мировой войны и Белого движения, эмигрировал в США в 1920; основатель и председатель Российского комитета освобождения и Российского комитета, полковник авиации в армии США, организатор Славянского института, председатель Конногвардейского объединения.